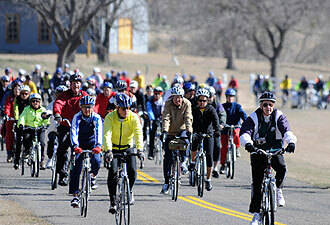 The LBJ 100 Bike Ride entering the LBJ Ranch. Let’s imagine that your conversation partner has young children. At the Johnson Settlement, where President Lyndon Johnson’s grandfather and great-uncle were cattle drivers, kids can see real Texas Longhorns. And, at the LBJ Ranch, experience a working cattle ranch complete with Herefords descended from the original herd. 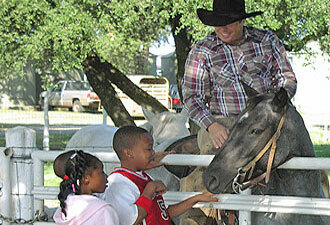 October 11-12 brings Family Fun Weekend to the ranch. On these two days, visitors of all ages can enjoy beautiful fall weather while participating in 1K, 5K, or 10K walk/run events or taking a bike tour of the ranch with presidential daughter Luci Baines Johnson. Later, when winter’s chill fills the air, families can celebrate A Timeless Christmas. The hometown of the nation’s 36th president glitters with thousands of lights, and his boyhood home and his grandparents’ settlement invite 21st-century Americans to learn about holiday celebrations in the 1920s and 1860s. Maybe your neighbor, like President Johnson himself, has a taste for automobiles and other vehicles. Such a person won’t want to the airplane hangar near LBJ’s Texas White House. The hangar has been turned into an exhibit area where one can see the LBJ Ranch car collection. A Ford Phaeton touring car from 1934, Lincoln Continental convertibles, and a sample of the Amphicar, which could carry passengers over roads and water, await your imagination. Perhaps, however, you’re chatting with someone whose passion is not historic vehicles but simply history. He or she will see Lady Bird Johnson’s crimson suit, enjoy exhibits at the visitor center, and be enthralled by a tour of the Texas White House. The Johnsons called the ranch their “Heart’s Home.” This beautiful house, home to the Johnsons beginning in 1951 and opened for the first time to the public in 2008, features original furnishings and displays personal objects just as they were when the Johnsons lived here. For a real blast from the past check out LBJ’s office as it was in the 1960s, plus his family’s homey living room, dining room, and kitchen. And, just across the way is LBJ State Park and Historic Site. So, what will you do here? 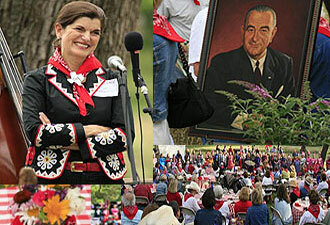 Indulge your inner cowboy or car enthusiast, check out a president and his prairie, get nostalgic with 1960s décor, or simply bask in the serenity that President and Lady Bird Johnson treasured – whatever brings you to Hill Country, come on down to spend a day like LBJ. Begin your adventure at the park visitor center in Johnson City to get the most out of your visit.